This is a transcript of the talk delivered by Prof. G. Venkataraman in the Divine Presence of Bhagavan Baba in Kodai Kanal on May 2, 2009. 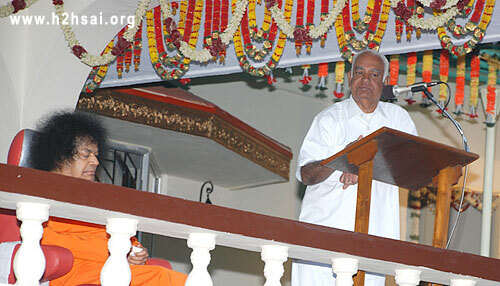 On that evening, Mr. V. Srinivasan, the All India President of Sri Sathya Sai Seva Organisations, introduced the professor to the audience and before he finished, he also expressed His immense gratitude to Swami for His copious compassion, for the Lord had decided to come outside and sit on the veranda even though the weather was very uncomfortable with chill winds blowing from the hills around. The professor began his talk by referring to that remark of Mr. Srinivasan. This simply means ‘Love is God and God is Love.’ Swami says He is Love; Live in Love (applause). 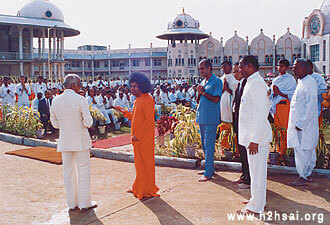 Swami has been very kind to give me the hint about what to speak on - How to live in Love? That is not really a very difficult topic because all I need to tell is what He is doing and that is not very difficult. But let me first preface my remarks by pointing out that when Swami talks about Love it is not the way you and I understand Love – in terms of affection or attachment or the way poets romanticise about it or anything of that kind. The Love that God has and exhibits is of an entirely different dimension and it is something beyond this world; this is the point we should grasp. That Love has no parallel; it is a unique attribute of God - it is Pure Love. How does Pure Love manifest itself? Through compassion; and this we do not understand. But we are familiar with sacrifice because every mother sacrifices. Therefore we must try to understand Pure Love in terms of sacrifice. God does not feel any sense of sacrifice. For Him there is no such thing as sacrifice. Swami suggests that it is ‘Selfless Sacrifice’. I beg your pardon; I was going to come to that. That selfless sacrifice is an attribute of the atman, which Swami talked about a few days ago. Therefore, I have to speak about this aspect which is eternal, out of this world, intangible, immortal, indescribable, ethereal and so on. How does this manifest in the world as Pure Love? It is not individual, not even global; it is cosmic and in fact beyond - it is Selfless Love. 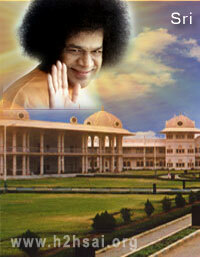 Swami’s life has been a message of Pure Love – Selfless Love and Boundless Sacrifice. We talk about it, give lectures on this, and say that only God can do it; we cannot. That is the myth I want to demolish. God comes down in human form to show that humans can do what He does as an avatar (incarnation of God) for the simple reason that the same God is in all of us. As Swami said the other day, ‘You think there are so many people; in reality there is only one God who is appearing as so many’. If I want to see a large diversity of people I will observe only that; they are only reflections. But if I want to see God I will notice nothing but God. If we want to solve the problems of the world, then that is the way we should watch. There are no enemies because everything is God. Now, how does one do that? I will explain this by drawing upon the message that is contained in the life of Swami. Swami incarnated in the year 1926; I was not born then. But I was very much alive when He left school at the age of fourteen in 1940. I was eight years old and living in Karachi. The world war had started and life was very difficult for us in India though we were still far away from the theatre of war. There was rationing and many difficulties. Imagine at that time a small boy saying: “I am going to serve the world.” Who would digest that? People around Him then did not believe this; but they certainly saw that there was something very special and that was the magnet of Divine Love - Pure and Selfless Love. Without knowing much, they came to Him in those days as many come even now. At that time of course many did not come from all over the world - that was to happen later, in slow stages. But, as always, Selfless Love attracts. Over a period of years He built it up. On May 25, 1947 in a so-called personal letter that He wrote to a member of His family, Swami said, ‘I have three objectives.’ It was a delineation of the aims of the avatar in this kali yuga, the present age. Lord Krishna had declared this but Swami was restating it. 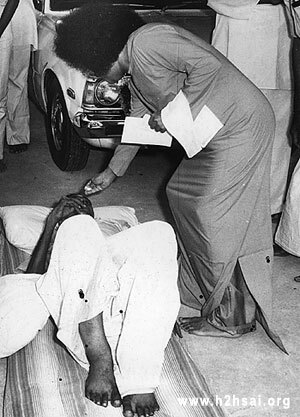 He said: ‘I want to fill everyone with ananda (bliss)' and that is what He is doing now. Why did He come and sit outside now? Because He wants to fill all of us with ananda (applause). More than anything else, He said, ‘I am going to alleviate the suffering of the poor.’ That is what Selfless Love and Compassion is all about. Love without Compassion is meaningless while Compassion without Pure Love is impossible. Let me give you some examples of the phenomenal power of this Selfless Love and Compassion which every one of us is capable of because He is in all of us. Does not Swami say, ‘I am in you’? It means that the power of God is in us; only we are refusing to switch on that supply. I will start with the year 1990 for a very simple reason. Something phenomenal happened during that year which nobody expected. 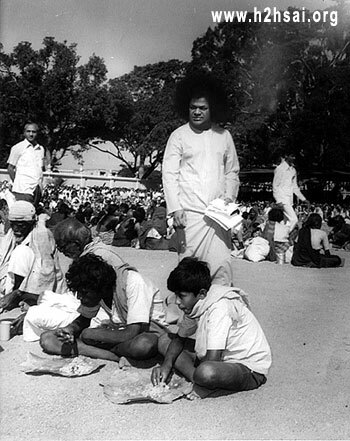 On November 23 which was the 65th Birthday of Swami - the Lord does not have a Birthday; but this incarnation has anniversaries - Swami told a huge crowd seated in the Vidyagiri Stadium in Prasanthi Nilayam: ‘In one year from now, there will be in this village, a Super Speciality Hospital which will offer treatment free in Cardiology, Urology and a few other disciplines – absolutely at no charge to all. Why should the poor of India be denied the advantages of the advancement in the field of medical technology?’ Everybody clapped (applause). But few believed in it because we don’t have confidence in ourselves, in our atman which is in us; we trust only our body. And what happened that year? 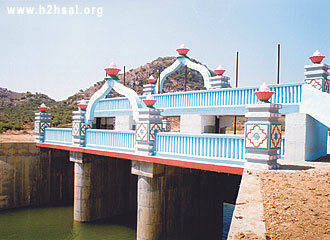 In April 1991 Swami was in Kodai Kanal. I heard from Mr. Narasimha Murthy that Swami spent around forty one days in this hill station that year. The hospital was to come up in a few months. Nevertheless Swami said, ‘It will begin to function on the announced date.’ Not many believed this. 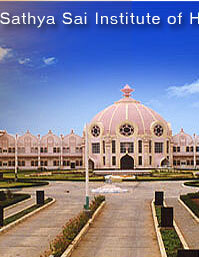 I came to Puttaparthi in June that year to have Swami’s darshan. As I passed by the site where the hospital was supposed to be built, I just saw the perimeter wall and some structure coming up. Between June and November there was hardly any time. But let me tell you that on November 22, 1991, at 9 a.m. the Prime Minister of India flew in, and I saw this with my own eyes. He was received at the airport nearby and driven down hardly fifty metres. 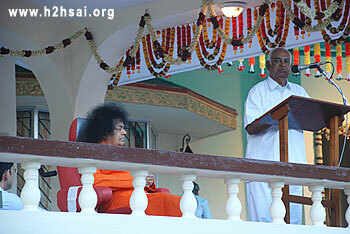 Scenes on the day of the inauguration of Sri Sathya Sai Institute of Higher Medical Sciences, Prasanthigram. 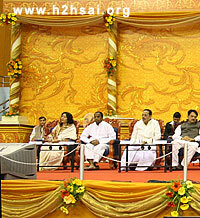 The then Prime Minister of India, Mr. P. V. Narasimha Rao was present on the occasion. 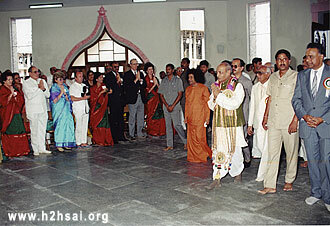 He did praanams (offering salutations) to Swami. We were all standing outside listening to the police band. There were no speeches! He simply cut a ribbon. 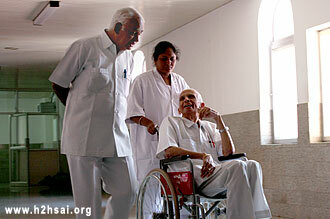 Swami went inside and lit a lamp and the first surgery – an open heart surgery – was performed! In fact, it was not one, four! In exactly one year as announced earlier. The architect who built the hospital said, ‘How can a hospital of this size and magnitude come up in one year? Impossible!’ As the President of the Royal College of Architecture, England, who was appointed by the Queen of England, he was indeed a very distinguished man; he said it was not possible within that time frame. 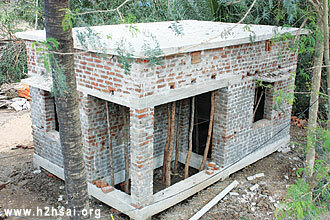 But Swami said it was going to be built. It was impossible for humans perhaps, certainly not for God (applause). So we all say God can do anything. Let me tell you this: Many of Swami’s students whom you see in action everyday here were sent for training to work as perfusionists and various other technical officers. They went to All India Institute of Medical Sciences, New Delhi. The doctors there said, ‘Oh! 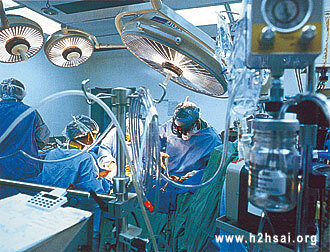 Your hospital will work only for one month or maybe six weeks. It won’t survive more than that.’ That was in November 1991. Now it is May 2009. That hospital is still functioning (applause). It has worked all these eighteen years. Tens of thousands of people have been treated. Look at the magnetic power of Pure Love! There is one Dr. Bhat from that hospital who is over 90, still conducts classes and trains students who appear for post-graduate examinations. Is this possible for ordinary people? Many people say we cannot do this; it is possible only for Sai Baba. It is not correct to say so when that ‘Sai Baba’ is in each one of us. We are refusing to see something beyond this world. He is in every atom of us. That is the most important message of Swami. 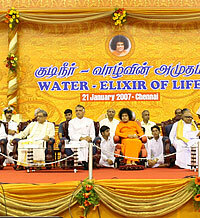 He said, ‘I am going to bring Krishna water to Madras’. I was really stunned! There is a reason for my reaction. In the last five or six years of my educational career, I lived in Madras. We used to have a lot of drought and they used to say in the newspapers that the only solution to this problem was to bring Krishna water to Madras. It looked like even Lord Krishna would come but Krishna water would not come (laughter). That was the state of affairs in that city. 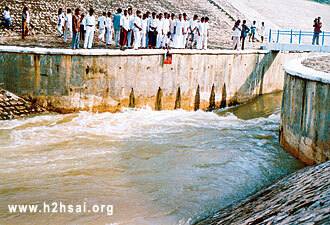 Finally in 1984 a project was launched in Corporation Stadium in Madras to bring Krishna water. 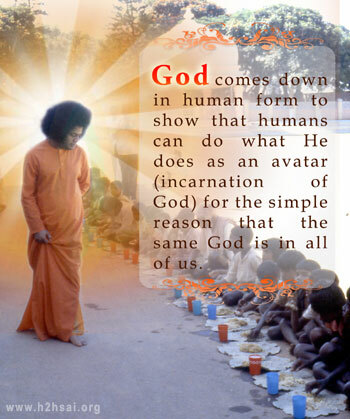 Every one of Swami’s actions is always for you and me and never for Him. That is something we do not understand. The day we realise that we will be redeemed. Swami by seeing Him in all the others? In 1997, there was a formal function to mark the completion of a canal from River Krishna to the Poondi Lake Reservoir in Madras. This was supposed to bring drinking water to that city. The capacity of that canal was 12 tmc (One tmc equals 1000 million cubic feet). 12, 000 million cubic feet of water was supposed to be delivered from River Krishna to Madras every year. Since then, every year, for the first five years, the amount delivered was less than half tmc. Can you imagine that? 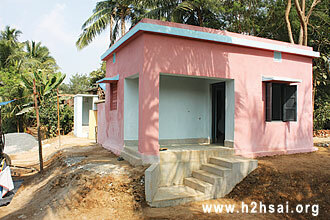 The capacity was 12 tmc whereas only ½ tmc of water was received with a maximum of two or three tmc. As mentioned this was the case for five years. That was the time Madras experienced severe drought because the North-East monsoon had failed for five consecutive years, making life very difficult. People of Madras underwent untold suffering. There in Bangalore there was no representation from Chennai. Swami just said, ‘I am going to give water to Madras’. The project was completed in exactly twelve months. On the 79th Birthday of Swami, water was released from Kandaleru and in just four days it crossed the zero point and came to Chennai! It never happened before (applause). Let me tell you from that day onwards Chennai has not had any drinking water problems! 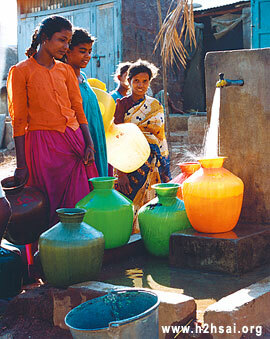 Water comes in every tap and that is a city with a population of 8 million (80 lakhs). What two governments of two states could not achieve Swami did. We have got a film where He says, ‘Tappaka Jarukuthundhi (Telugu) - This is going to happen’. He also said, ‘This is My Sankalpa (Will); whatever I decide will happen’. It was held in the air-conditioned Nehru Indoor Stadium and there we saw Chief Ministers of four states: Chief Minister of Maharashtra, the state where the River Krishna originates; Chief Minister of Karnataka, the state through which the River passes; Chief Minister of Andhra Pradesh, the state through which the River flows before it finally meets the sea, and of course the Chief Minister of Tamil Nadu (whose views on Spirituality I need not mention here). 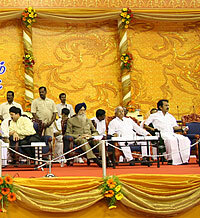 This CM took the trouble of personally honouring Swami saying, ‘My goal is to serve the people. I do it through the political channel. You do it through the Spiritual field and Yours is always the best way because it is Pure and Selfless (applause)’. I can go on and on because there are so many such stories of sacrifice. If we take the example of Rama Avatar, it is an amazing epic of sacrifice; all of them – Rama, Lakshmana, Bharatha, Shatrugna, Sita - sacrificed. Can we see this anywhere? God comes down to teach us the method of Selfless sacrifice. Now everybody says He is God so there is nothing that He cannot do. He can make dead people come alive, change night into day and vice versa, and so on but we cannot do this. If Sai Can Do It, We Can Do It! There is a very beautiful question that Saint Thyagaraja asks in a song where he sings ‘Apa Rama Bhakthi…’ that is: ‘Oh Rama! How can a monkey jump across the ocean?’ He himself gives the answer: ‘Monkey was able to cross the ocean because of its bhakthi (devotion) for Rama (applause)’. Rama Bhakthi is so powerful. The sacrifice of the four Vedas, who were represented by the four sons of Dasaratha are all now telescoped into one Sai Rama. He is sacrificing (applause). Now if Rama Bhakthi can make a monkey jump across the ocean, I put this to you dear sisters and brothers: Can Sai Rama Bhakthi not control our monkey mind and help us achieve many things (applause)? That Sai Rama Bhakthi should take us out of this world. Swami has given it to us in very simple terms: He says there are only two things you have to do: ‘Daiva Preethi, Paapa Bheethi’ (Love of God and Fear of Sin). We all say we love God but we are not afraid of sin. How can we love God and not be afraid of sin? And what is sin? It is not merely what Moses says or what all the scriptures say. 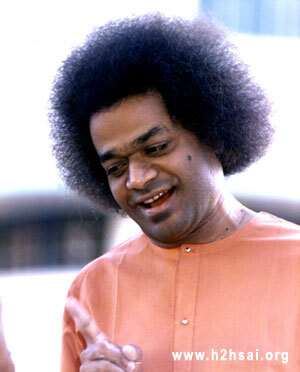 Sin is anything that will cause pain to Swami and that is very easy to find out. 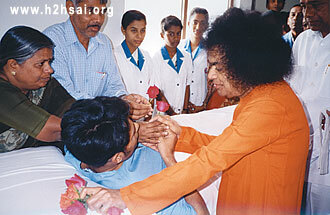 Every one of Swami’s actions is always for you and me and never for Him. That is something we do not understand. The day we realise that we will be redeemed. If Swami can do so much for us, why can’t we do something for Swami by seeing Him in all the others? Orissa is supposed to be a backward state. But there are very big industries there connected with mining, steel making and so on. 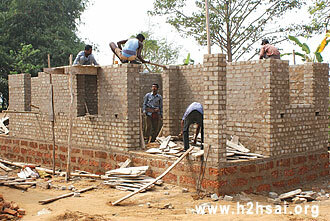 They are all huge projects where tens of thousands of crores, that is, a few billions have been invested. But nobody came forward. Swami said, ‘I will care’. Why? Because in 1947 He said, ‘I am going to alleviate the suffering of the poor.’ When God gives a word, He never forgets. Love gives and forgives and forgets. That is Selfless Love. Immediately after His Birthday (in 2008) Swami sent many people including Mr. Srinivasan to go and see what was happening there. He said, ‘Let us build houses for the poor and the displaced who are affected by the flood.’ I don’t know how many of you are aware that the first batch of 200 houses have been completed and ready. Additionally I must mention that they are very spacious, with lots of room for a family to live, including kitchen, dining hall, veranda, separate bath room, toilet, etc. and raised well above the ground level so that if there is a flood in the future, it will not enter the house (applause). The keys for the first batch of houses were handed over to the occupants. They all came to Prasanthi Nilayam by train in batches. 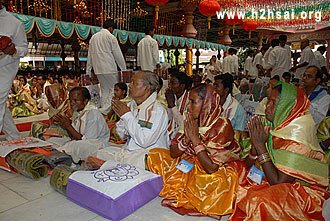 On Rama Navami Day (April 2, 2009), Sai Rama Himself handed over the keys (applause). You called today and He is here (out in the veranda). He is everywhere, wherever people look out for Him. He may not physically go but people do feel His Omnipresence. That is why there are so many people coming here from so many countries: there are Russians here in so many rows; also from Japan, Croatia, and many other countries the names of which we have not heard of. How many of us have heard of countries in Latin America - the Dominican Republic, Haiti, etc. We don’t even know where they are located. 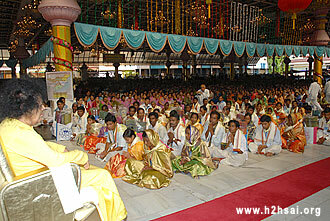 But they know where Swami is; they come to Him wherever He is, be it Kodaikanal, Bangalore or Puttaparthi. 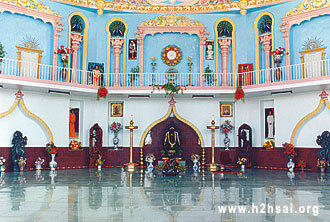 In 1940, when Swami returned from Uravakonda to Puttaparthi there was no road to this holy town. To come to Puttaparthi, one had to go to Karnatakanagapalli on the other side of the river and walk from there or come in a bullock cart. That was how remote it was. There was no electricity, telephone, etc. But Swami did not go out anywhere and has done things that governments are not able to do. That is the power of the Atman. He represents the Atman. He is the embodiment of the Atman. Repeatedly He says, ‘You are also the embodiment of the Atman; you are Atma Swaroopa and Prema Swaroopa. With all that love locked up in us, with all the power of that Atma present in us, what are we waiting for? That is the question we should ask ourselves. The steps are very simple: ‘Daiva Preethi, Paapa Bheethi’. Then automatically there will be ‘Sanga Neethi’ (Morality in Society). All the problems of the world would dissolve. We don’t need dollars, or loans from IMF (International Monetary Fund). We need to open our mind. If Rama Bhakthi could make the monkey jump across the ocean, Sai Rama Bhakthi should be able to make ten times more (applause). So the question we should ask ourselves is what are we waiting for? We are not willing to do that because we don’t have self-confidence. And this does not refer to the definition of this word according to the English Language Dictionary; it truly refers to Atma Viswasam. We should have the faith - ‘I am the Atma’. That is what Swami said in the discourse the other day - See the Atman in others; then you will feel compassion because when the other person suffers you suffer too; you feel pain when he is in sorrow. What is Eternal? Truth and Righteousness. So the actions we perform must be reflections of Pure and Selfless Love and be rooted in Dharma (Righteousness), Sathya (Truth) and Prema (Love). If we have this, then everything is taken care of. Yesterday (Eswaramma Day) we saw that more than ten thousand people came (to be fed) which is a regular feature in Kodai Kanal. All the people gathered to serve them. We call it Narayana Seva, and not poor feeding. This is because each one of them has Narayana (God) in him/her. That is the beauty of spirituality. The problems of the world cannot be solved by economic, political, sociological or ideological methods. They have all been tried and are doomed to fail. Unless we go to the basic values that have come to us from the time of Sri Rama to Sai Rama, we are not going to improve. That is the only way and there is no other way. We must go back to Purusarthas where Dharma comes first, followed by Kama (desire) and Artha (wealth). There must be a ceiling on desires because the other end is Moksha (Liberation). Dharma is a platformwhere everything must be based. Sathya (Truth), Dharma (Righteousness), Shanthi (Peace), Prema (Love) and Ahimsa (Non-violence)- is our true nature. Once Swami asked, ‘What is the meaning of being true to yourself?’ And explained that it means you must be true to your nature as the Atma. We must give primacy to the Atma which is our real quality. That is what we must pay attention to. 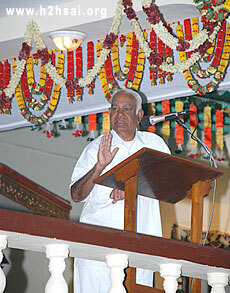 How many times He begins the discourses addressing all as ‘Divyatma Swaroopalara’ or ‘Prema Swaroopalara’. If we miss these words we lose everything. Swami has come to give us an eternal message; that is what we must pay attention to. He is in the world but His message is rooted in eternity. Repeatedly Swami says, ‘You are also the embodiment of the Atman; you are Atma Swaroopa and Prema Swaroopa. With all that love locked up in us, with all the power of that Atma present in us, what are we waiting for? That is the question we should ask ourselves. The steps are very simple: ‘Daiva Preethi, Paapa Bheethi’. Then automatically there will be ‘Sanga Neethi’ (Morality in Society). This means ‘Chant whichever name you like, but sing it with Love and feeling’.And the last part is very important. If we have that bhava or the Atma Bhavam or Atma Viswasam, then there is nothing that cannot be done. There is no need to fly to the moon. Atma is everywhere, filling all of space and time, and it exists even when there is no time and space because God is Atman, Atman is God and is beyond space and time. These two are just a platform upon which Atman rests (applause). 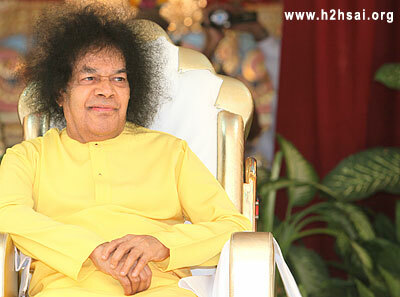 When we see Swami, we are in awe at His beautiful form; there is no limit to that beauty. He is growing more beautiful every day (applause). That fills us with ananda (bliss). But we must see through the window of that fascinating form the grand expanse of the Atman which is beyond everything and which manifests as Pure and Selfless Love, and Incessant Compassion. We are all capable of it. Why don’t we realise that? Let us take a resolve on this day that we will show a bit of compassion every day and it will grow by leaps and bounds. If Hanuman can jump over the ocean, our compassion can jump over the Earth; that is what we should say. We underestimate ourselves. God has put a tremendous amount of power in each one of us. If we multiply that power with the population, it is infinite. What is there to stop us? Nothing, except our ego – the false ego and our faith in the transient body that belongs to us. As a scientist I can tell you that atoms come into me and go out without my knowledge. When I breathe in do I say this carbon dioxide you go out of me, and this oxygen you come in? I have no control over it. I don’t even know that when I rub my hands my cells fall down. When I eat something in the afternoon, I don’t even know where the food comes from, in the sense, I have no idea where that rice, pulses, etc. was grown. It may have come from Australia; so some atoms from Australia are going into me. When I breathe out, some carbon dioxide is going out of me. We don’t know whether it goes to Peru or Chile. We have absolutely no command over our body. But we think we have control. When we chant ‘Aham Vaiswa Naro Boothwa’ before partaking food, we referto this Prana Shakthi (power of breath) which is also the digestive power within. If I am talking now, it is His power which is enabling me to do so, else my body is just a jadam (Inert matter). All of us are His instruments. But we will remain foolish so long as we don’t remember that we are His instruments. That was His main message to Arjuna: ‘Arjuna, Bhishma and Drona are going to die. I am asking you to fight. But do so by remembering that you are My instrument. That will redeem you’. Everything is pre-ordained by God. But if we humbly seek to be His instruments and do His bidding in this world, then the world would be redeemed and we would be fulfilled. That is the message of Swami. Let us respect, honour and value this message by offering our salutations and making the resolve that we will follow Him. Thank you for your patience. 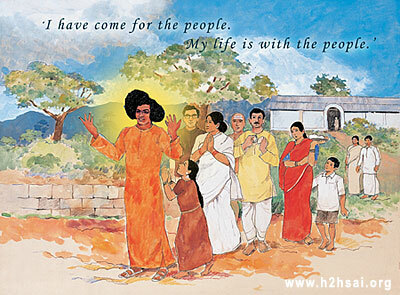 Sairam.